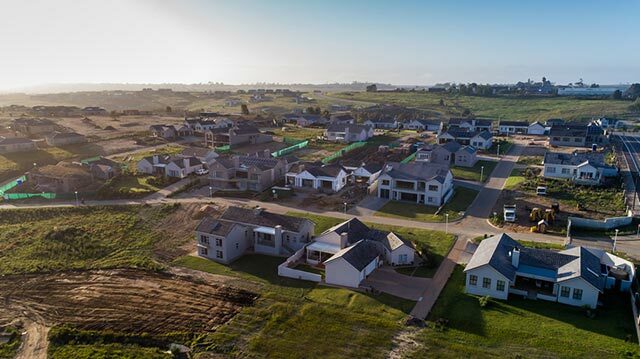 Groenkloof Rif is a gated community lifestyle senior estate in George with the important difference that it is directly connected to Groenkloof George Retirement Village. The significance being that residents in Groenkloof Rif have use and access rights to all of the Groenkloof George Care Unit and are connected to the 24/7 medical emergency response system of the Care unit in case of medical emergencies. The Groenkloof Rif constitution has no age restriction, but since the estate service the niche of seniors that still want a large property as well as the peace of mind of a Care Unit, inside a lock up and go gated community, we refer to it as a senior estate. You can choose between designing and constructing your own home within the architectural guidelines, or you can buy a plot and plan directly from the developer. Pedestrian and golf car access path to the Groenkloof George Retirement Village and Care Unit. The estate will be home to 42 families, when completed. The Groenkloof George Care Unit. Groenkloof George Community Center, which includes metalwork, woodwork and other hobby rooms. Extended walkways in natural habitat. Spectacular views of the Outeniqua mountains. North facing houses allowing for light and warmth in your home. Close to some of the best golf courses in the world and several excellent bowling greens. Close proximity to the Garden Route Mall with a variety of shops and a cinema with 7 theaters. Easy access to town center which is home to great doctors, specialists and hospitals, e.g. George Mediclinic. Easy access to the N2 and the George airport.